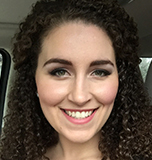 Abbie Baumann is currently Sales and Marketing Manager for Overhead Door Company of Augusta™. She has held this position for 4 years now and enjoys working day to day with her family. Abbie has a heart for the elderly and loves being a part of When Help Can’t Wait. She believes that the elderly are the foundation for what we have today and we should honor and take care of them for that. Abbie is married to Greg and they have 2 “fur babies”, Buck (German Shepherd) and Nelli (Chocolate Lab). They live in Grovetown, GA.